Originally published in the Irish Echo, January 16-22, 2013. The melodeon seems to be having something of a resurgence. Back in December I wrote about the Tin Sandwich Band’s lovely new album “By Hook Or By Crook” which features Danú’s Benny McCarthy on the instrument, and now I have in hand “The Genius of Peter Conlon,” a collection of recordings issued on 78 RPM record between 1917 and 1929. Produced by Emmett Gill and Gerry Clarke, it is an outstanding offering. 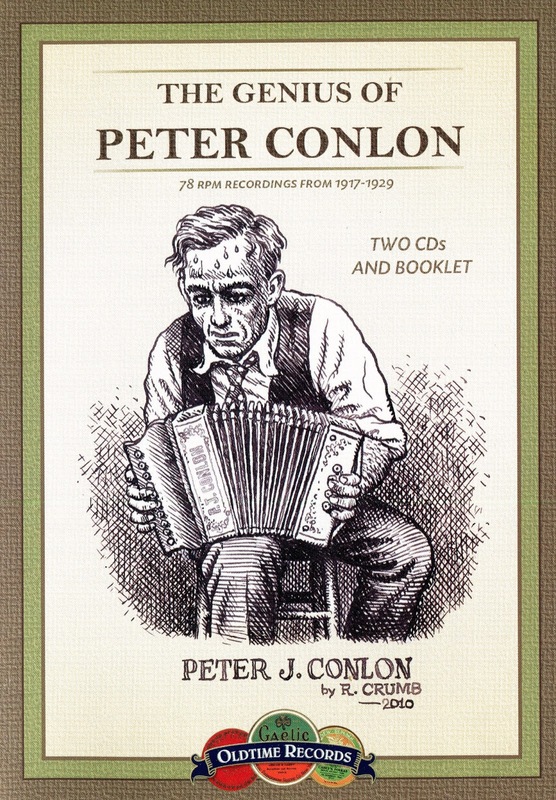 Peter (or more commonly, PJ) Conlon is a name that will be familiar to Irish music historians as not only an important early melodion player, but also as one of the earliest Irish-born musicians to record (the only two to predate Colon were the duo Eddie Herborn and James Wheeler). Until now, those interested in Conlon’s work were generally collecting it on record, but this collection brings together everything available in one place, and in so doing fills major gaps about his life and music. The set includes a lavish 44 page, full color booklet comprising several sections. The first, a deftly researched biographical sketch comes from Alan Morrisroe, Emmett Gill (about whose brilliant album with Jesse Smith, “The Rookery,” I happened to write about in December) wrote the second, a brief descriptive essay about the recordings while the third, an essay called the “Accordion in Irish Music During the 78 RPM Era” was provided by Charlie Harris. The booklet also includes several tributes to Conlon’s playing from notable musicians, two transcriptions of Conlon’s tunes, label scans and a complete discography of Conlon’s work. As one might expect, the music itself is outstanding. One can hear Conlon’s virtuosity shine, for example, on “Paddy on the Turnpike” and the “Broken Pledge.” However, tracks like the “College Grove / …”, “Phil the Fluters Ball” (with singer Shaun O’Farrell), the “Banks of Newfoundland (with banjoist Walter Lally) and the “Tap Room / …” (with fiddler James Morrison) are all brilliant. The digital transfers are well handled and are generally clear. With few exceptions, the source material was in good, playable shape and helped contribute to this fine presentation. The set’s presentation of a comprehensive booklet in a plastic DVD-style case is reminiscent of Viva Voce’s lovely 2003 collection of John Feeney’s recordings, “When It’s Moonlight in Mayo,” Gael Linn’s wonderful 2004 set “Seoltaí Séidte/Setting Sail” of recordings that label issued on 78 RPM between 1957-1961, and Gael Linn’s 2011 re-reissue of their absolutely essential Michael Coleman collection, “1891-1945.” This is the way archival collections should be released. This is the fourth of Oldtime Records’s reissue projects. The first two, “Vol. 1. U.S. Recordings” and “Vol. 2. U.S. Recordings” include several great tracks by major artists of the period, while the third, “Vol. 3. Piping Rarities,” is a collection of early piping recordings. Although I regrettably don’t possess these discs, each of them appears fabulously curated; if this P.J. Conlon set is any indication of prior success, then these earlier releases are of a similarly high quality. Ultimately, this an outstanding and loving tribute to one of Irish music’s earliest leaders and to an instrument that is currently under appreciated. Although this set probably isn’t for the casual listener whose sensibilities aren’t accustomed to the comparatively low fidelity of acoustic era recordings issued during the 78 RPM era, it is an absolute must have for any lister or institution with an interest in traditional Irish music’s history. To learn more about the P.J. Conlon set, visit oldtimerecords.com.